How comes there is a best time to consume BCAAs? Should it matter when you are taking BCAAs yet it is all about getting the amino acids into your system? Well, timing is absolutely everything when taking BCAAs and other supplements! You need “fuel” and other nutrients to function effectively. If you do not receive the right nutrients at the right time they will not help you much. You will be like a car but without engine oil or gas. They are three in number – Leucine, Isoleucine, and Valine. When taken together, these amino acids can bring about good benefits. Depending on what benefit you want, you will need to take BCAAs at a specific time. For instance, to delay fatigue, you need to take BCAAs immediately before starting to train. So when you take BCAAs is very important. Read on to learn more. What are the best times to take BCAAs? To know the best window of time to take BCAAs, we must understand how BCAAs work in the body. Studies have shown that branched-chain amino acids peak in your system about half an hour after taking them. Here, we are talking about the general effects of BCAAs including reduced muscle soreness, higher endurance, and delayed fatigue. You cannot take BCAAs near the end of your workout and expect them to kick in and delay muscle soreness in the next ten minutes. You will have to give them time to work and to do so you will have to take them early. Obviously, some other benefits such as accelerated fat loss and lean muscle growth come with time, so timing is not so big of an issue if they are the benefits you are aiming for. However, although not a big of an issue, it is still important. There is a long-standing gym myth that people have about an hour after training to consume protein/ amino acids so as to reap maximum muscle growth. However, contrary to this long held myth, recent studies are showing that, you have as many as five hours after training to get maximum muscle growth. What this means is that there is no harm in consuming BCAAs an hours, two hours, or three hours after exercise if you are looking for lean muscle growth. Moreover, there is also no harm in taking BCAAs before exercise. Studies have shown that taking them one or two hours before training will provide you with enough nutrients for training and will make the timing of the post-workout intake less important. In simple terms, you can take BCAAs before workouts to make it less necessary to take them post-workout. So am I saying you can take BCAAs anytime? Well, yes this is what am saying. But is anytime the optimal time? No. The optimal time of taking BCAAs is during workouts. This helps to bring about the supplements main benefits. To make sure your body does not lack BCAAs during the rest of the day and to make sure you are taking as close to the optimal daily limit as possible, you should take BCAAs during and after workouts. Is the case the same for women? Most studies have shown that women particularly take BCAAs for weight loss and for athletic benefits. Therefore, the best time for them to take BCAAs to achieve these goals would be during workouts. This is why you will find many manufacturers of BCAAs for women supplements advice their clients to take their products during workouts. The best quantity of branched-chain amino acids that is optimum for women is about 10 grams. This has not been proven by science but it is what most female athletes and users of BCAAs have found to be best. But before you take 10 grams, consult with your nutritionist to get more information. He or she should know what is best based on your body mass and other factors. If you are a bodybuilder, a power lifter, or just someone who wants to get big, you need to take BCAAs. Because BCAAs will not only help you gain more lean muscle, they will also help you to build you to build your endurance and to get less fatigued. Research to clarify the optimum time for taking BCAAs for bodybuilding has been inconclusive. Some scholars are, however, of the opinion that it does not really matter when you take BCAAs. According to them, whether you take BCAAs before or after workouts is inconsequential. However, what we do know is that it is best to take BCAAs during workouts even for bodybuilders. This is because it is during and after workouts that the body needs the most BCAAs to recover and to grow. Do You take BCAAs Before or After Workout? To tell you facts about this, we took a look at some of the existing studies that have investigated the effectiveness of BCAAs when they are taken at different times. In the study, a group of athletic men were given 25 grams of a protein supplement with 5.5 grams of branched chain amino acids either before or after lifting weights for 10 weeks. The researchers in the study found the same improvements in strength and body composition in the group that was taking BCAAs before and in the one that was taking BCAAs after. They concluded that there was no difference in results whether one took BCAAs before or after workout. More research obviously needs to be done to investigate this matter exhaustively, but there is really no difference. It is usually just a matter of personal preference. When Should You Take BCAAs for Fat Loss? If so, then we need you to be taking BCAAs correctly to accelerate yourself towards the end of your weight loss journey. It also helps people to improve their cardio and their endurance. Better cardio and endurance means training harder and longer and incinerating more fat in the process. One of the things that prevents overweight people from working out more is fatigue. Taking BCAAs prevents the onset of fatigue and helps people to exercise more without feeling tired. To ensure that you really avoid fatigue during training, you need to constantly top up the supply of Leucine, Isoleucine, and Valine in your blood. This is why people often sip BCAAs during workouts. Sipping them during workouts will boost your energy and delay the influence of serotonin which is the brain hormone that communicates tiredness to the rest of the body. So the best time to take BCAAs for fat loss is during workouts. Moreover, taking them during workouts will ensure that your muscles absorb appropriate amounts of the nutrients and help maintain your muscles and to aid their recovery and growth. When to Drink BCAAs: How Many Times a Day Should I Drink it? Sipping on BCAAs during workouts ensures your body never runs out of these essential amino acids. This constant supply of essential amino acids will help prevent the onset of fatigue and to improve your physical and mental performances. Apart from reducing fatigue, sipping BCAAs also helps to maximize the usage of fat as fuel by the body to encourage even more fat burning. If you particularly want to lose more fat when training on a low carbohydrate diet, you should sip BCAAs throughout your workout. Most BCAA formulations have directions on how to take them. Most of the time, if they are to mixed and sipped, the manufacturers advice that they are taken once during workouts. The one scoop they tell you to take and mix with water or your favourite drink usually has just about enough amino acids to sufficiently supplement you for the whole day. Should I Take BCAAs Before Bed? Taking branched-chain amino acids before bed can supply your body with essential amino acids for better protein building and muscle building at night as your body repairs itself and gets itself ready for the next day. And with enough BCAAs in the vicinity, your body won’t resort to breaking down your muscle tissue. So taking BCAAs at night also prevents muscle wastage (catabolism). However, not all BCAAs should be taken at night. If your BCAA product contains stimulants such as caffeine, it will cause you problems. This is because stimulants like caffeine usually provide a serious boost of energy and a sharpening of mental focus. Thus, taking supplements containing them will result in sleeplessness. So only take BCAAs without stimulants, if you want to take BCAAs before bed. 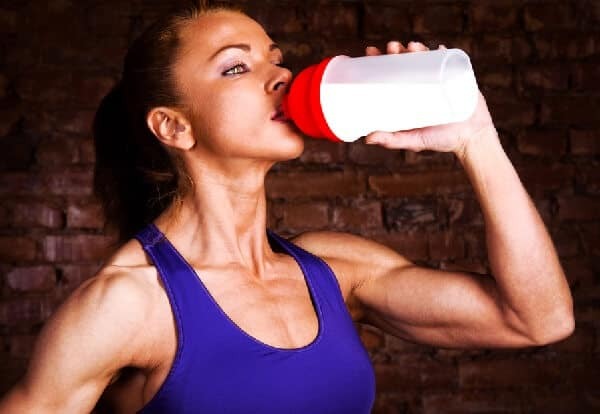 How Much BCAA Should a Woman Take Daily? This translates to between 5 and 8 grams of the supplement a day depending on your bodyweight. So as a woman, since your weight is low, you should probably be taking only five or six grams of BCAAs per day. Taking this amount will provide you with enough supplementation to reduce muscle soreness, to cut fatigue, and to maintain muscle mass. Please note that taking more than the recommended amount could lead to unwanted side effects such as headaches and stomach aches. What I can tell you as a constant reader of this site’s article, is that you should always read directions carefully. You should also consult your nutritionist to find out if it is right for you to take BCAAs. They will advise you accordingly. How Long Do BCAAs Take to Work? BCAAs take about half an hour to peak. So if you wanted to experience the positive health benefits of BCAA supplements now, you should have taken them thirty minutes ago. You should use this as a guideline to time yourself appropriately and to guarantee getting the results you want at the time you want. Should I Take BCAAs Pills or Powder? BCAA powders are better than pills in several different ways. The primary difference is in the statement below. To provide your body with a good dose of BCAAs, a good enough dose that will produce a positive reaction in your body, you will need to consume between five to ten grams of the amino acids a day. In terms of BCAA powder, this will translate to probably one scoop only of the powder. But in terms of pills, it could translate to taking anywhere between ten and twenty BCAA pills at ago. Who wants that? Moreover, BCAA powders are more potent and usually taste great or can be made to taste great when mixed with a favourite drink. However, you cannot really mix your pills with your favourite shake, can you? So always pick BCAA powders over pills if you can. QUE: Is BCAA a fat burner? Several studies including a 2011 landmark study revealed that BCAAs can help to accelerate the rate at which you are experiencing fat loss. This means it is a fat burner. It accelerate fat loss by increasing internal body temperature, which increases metabolism and enhances the burning of calories. It also promote fat loss in several other ways. In conclusion, BCAAs are fat burners. QUE: Can BCAA make you gain weight? They help you lose weight not to gain it. The muscle they allow you to gain is lean muscle. Lean muscles are lean by definition. They also won’t make you gain weight. QUE: What are the side effects of BCAA? Most experts agree that taking BCAAs daily does not result in any negative consequences. They also agree that taking too much branched chain amino acids can lead to negative consequences. Some of the potential side effects one may experience by taking BCAAs high blood sugar levels, higher insulin resistance, headaches, nausea, and loss of coordination. However, most of these side effects are relatively rare because BCAAs are well tolerated by the body and are not toxic. QUE: Is BCAA a pre workout? Yes, it is. BCAAs are taken as a pre-workout supplement because they provide an energy boost, they provide amino acids for muscle building, and they delay the onset of muscle soreness and fatigue. So, they are very effective pre-workout supplement. QUE: Do they give you energy? They provide a very noticeable energy boost. One of the reasons why is that they normally contain stimulants such as caffeine which stimulate the mind and give energy. QUE: Can I take BCAA and Creatine? Yes, you can. BCAAs are pretty harmless. They can be combined with many other supplements including creatine to provide you with a supreme energy boost. QUE: Can I Use Both BCAA and Protein? BCAAs are kind of like proteins. In fact, many protein supplements do contain BCAAs. So combining the two is not problematic. It will help you recover and build more muscle faster. QUE: How long do BCAAs take to work? About 30 minutes. Check the post above for more information. QUE: Does BCAA make you sleepy? A few users have reported feeling sleepy after taking it on bodybuilding forums. However, taking it generally has the opposite effect which is increasing alertness and wakefulness just like coffee since many such supplements usually contain caffeine. QUE: How long should you wait to eat after taking BCAA? It is supposed to be providing BCAAs because you do not take adequate amounts of it from the foods you eat naturally. So you do not have to wait for long. QUE: Can you take BCAAs on an empty stomach? Yes. During fasted training or when you are on a low-calorie diet, taking BCAAs before training encourages the body to use fat as fuel and enabling greater fat loss and less muscle wastage. QUE: Do BCAAs reduce serotonin? Yes, it does. Serotonin is a hormone in the brain. Among its many functions, it is the one that communicates I am tired to the rest of the body. By suppressing its production, BCAAs help to prevent the onset of fatigue in the body. QUE: Can BCAA cause hair loss? No. In fact, they do the opposite. Most of hair is made of protein. Proteins are made up of amino acids including BCAAs. So taking BCAAs should only encourage the growth of more hair and not less. QUE: Do they make you pee more? If you sip a lot of BCAA in water you may pee more. But some brand supplements do not have this effect. So it largely depends on the supplement you are taking. As you can see, BCAAs can really promote weight loss. They can do it in many different ways. They also have several other benefits including promoting lean muscle growth and recovery. However, to get some benefits, you will have to time when you take it. For instance, to delay fatigue and muscle soreness, you need to take BCAAs before or during workouts. Apart from timing, you need to eat well and train hard to ensure you get the benefits you are looking for. The supplement you are using also needs to be a top quality supplement that is actually genuine to work. Read More about benefits here!